GOSHEN — From one end of the Goshen bench to the other, laughter could be heard, and teammates were smiling. There was a surprising level of optimism after leading Minisink Valley by only a point at halftime of the Class A quarterfinal. “It was the same situation we faced when we played against them the first time,” said Goshen point guard Erin Smith. 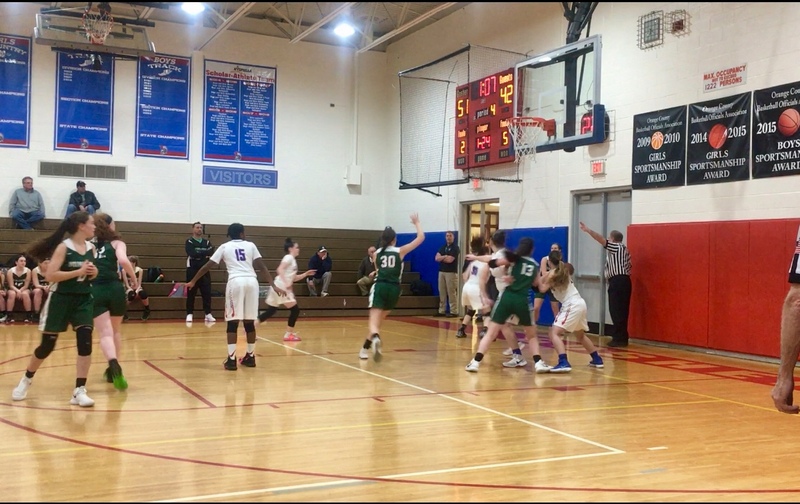 They did just that, out-scoring the Warriors 19-10 in the third quarter, securing a 56-46 victory, advancing to the Class A semifinal for the second consecutive season. Smith led both sides with 23 points (8/16 from the field, 6/6 from the free-throw line). Freshman guard Madison Clark added 15 points for Goshen (13-9). Mackenize Tresch & Saige Colon each led the Warriors (7-14) with 14 points. The Gladiators shot 46% from the field, (21/45), and scored twelve second-chance points. The Gladiators move on to the Class A semifinal against Saugerties; whom they lost to in the same game last season. Fun fact: 25-of-26 players that played in last seasons’ Class A semifinal, will be playing against each other, in this seasons’ Class A semifinal, including all ten starters. Smith, a junior, is only eight points away from 1,000 career points and can become the fourth in program history, and second in her family to reach the plateau. Her sister Katie — who graduated in 2017 — scored 1,086 points for Goshen. Right now, she’s focused on helping her team get to the Class A final for the first time ever. “I’m definitely going need to take more three-pointers and get to the free-throw line a lot more when we face Saugerties,” added Smith. To prevent a second consecutive semifinal loss to the Lady Sawyers, Harris wants his team to bring the same energy he knows they’re capable of bringing.